Calligraphy workshops are a unique opportunity to try your hand with a pointed pen and practice copperplate under the supervision of a professional calligrapher. 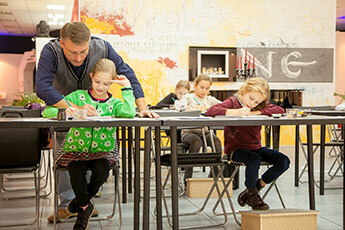 Workshops for organized groups of all ages include a tour of principal exhibits and a workshop on a specific writing form. Total duration is 90 minutes (45 minute tour, 45 minute workshop). Groups of individual visitors* - the last Friday of each month at 12:00, 13:30 and 15:00. A groups require a minimum of 10 persons. *A group of individual visitors is formed based on individual applications. Book the date and time for your workshop. Complete a workshop application (application form to be sent to the customer's email). Provide an advance payment of 3,000 RUB to book the workshop. The payment can be made in cash or via a wire transfer. On the date of the workshop the customer (group supervisor) pays the remaining amount of the service price. To cancel or amend your workshop, please contact the museum manager by phone at +7-495-728-77-58. Price of the workshop package consists of the tour operations price, entrance fee and workshop fee. Payment for the workshop can be made in cash or via a wire transfer. Fee of 800 RUB (per person, no privileges). Fee of 400 RUB (for members of multiple children families*). 1 person free of charge, 250 RUB per each subsequent person. Participation in the workshop for escorting persons is not included in the fee and is to be paid separately. *Privileged entrance granted upon presentation of relevant documents. Minimum workshop fee is 8,000 RUB privileged inclusive, regardless of the number of participants. Fee 800 RUB per person. Minimum workshop fee is 8,000 RUB regardless of the number of participants. Fee of 1,200 RUB per person. Workshop for a group between 9 and 14. Minimum workshop fee is 10,800 RUB regardless of the number of participants. Participation fee for all ages (no privileges) – 800 RUB. 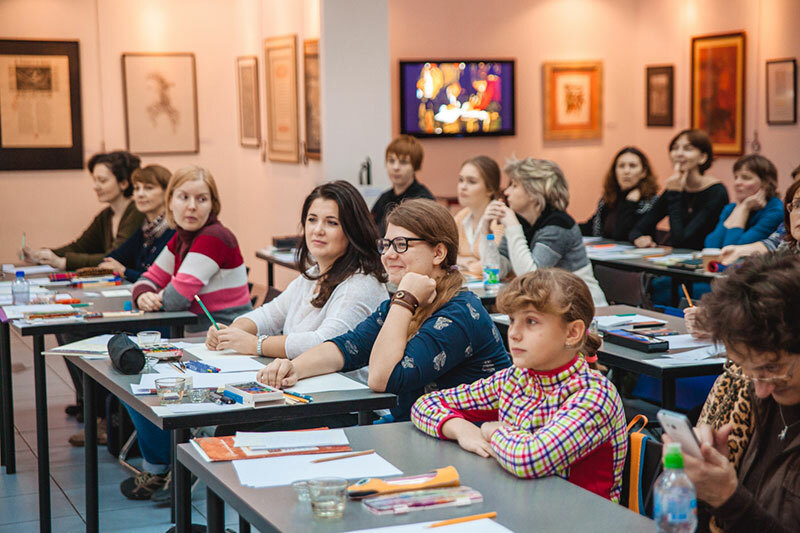 Participation fee for members of families with many children – 400 RUB. NB! Participation in the workshop is free if you arrange a group of individual visitors. For a second arranged group you get a gift certificate for a Museum workshop of your selection. The Contemporary Museum of Calligraphy is temporary closed because of its preparation for a new exhibition. If you have any questions, please, call +7 916 353 20 98.